First things first, The Plane. Stale air, germy seats, sneezy people... ugh. The first thing I do is a lap around my terminal to see what kind of breakfast they have to offer. Jet Blue, by far, has the most amazing terminal. They have greek yogurt, plain and multiple flavors, all natural bars, coconut water, everything! Tomorrow I'm flying American... not sure what they have but I'll be prepared just in case. I always bring a few packets of green tea, stevia (natural sweetener, calorie free, derived from a plant. 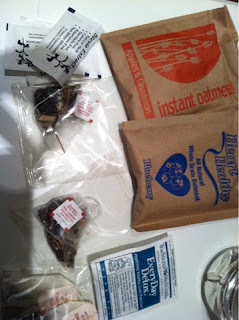 Don't eat splenda, equal, or any other fake sugar - you're better off eating a tsp of sugar if you don't have stevia - I'll go into further detail in a later post), and packets of oatmeal in my carry on. My flight leaves at 6:55, otherwise I would eat at home. Don't skip bfast! Here are some healthy options that you can usually find on most terminals: yogurts, oatmeal (at starbucks), lara bars, kindBars, etc. You don't have to go for the bagel just because it's easy. If I can't find anything healthy, I'll pick up some hot water in a cup at any of the vendors (they'll have it - they have tea, right?!) and pour my oatmeal in it. Tip: Yogurt parfaits are everywhere - beware: The granola packs a ton of calories and fats. If you pick one up - immediately dump at least half of the granola in the trash. I've found that the yogurt in them is usually a low fat variety so you're good there. Next, I grab the biggest bottle of water I can find and drink it throughout the plane ride. Lastly, I ask the flight attendant for hot water and make my own green tea with my stevia. They have regular tea on the plane which is fine, but, I like green better for all of it's antioxidant properties and the energy it will give me for the rest of the day. Remember the antioxidants in the tea, and the cultures in the yogurt are going to strengthen my immune system on the plane (in addition to all of the other awesome things it's doing for me). One more thing - don't sit until you are on the plane - you'll be sitting for hours - you can handle standing for 45 mins to an hour. Standing burns 1.5x as many calories as sitting... yup! Oh, and don't forget your hand sanitizer. Next, breakfast and lunch. Make a rule: no white/no sugar. What I mean by that is no white carbs... if it's not whole wheat/whole grain - don't eat it. Don't eat excess sugars either... they'll cause tiredness throughout the day at all of those meetings! Easiest way to stick to this plan is to look for lean meats, vegetables and whole grains on the menus. Breakfast is easy - there's usually healthy options at hotels. Lunch is harder. If you're at a restaurant and the options are minimal... just get a salad with grilled chicken (boring but you'll feel better later). If you can't stomach a boring salad... Pick a sandwich and make modifications. Ex: turkey club, no mayo, no aioli, on wheat, no fries. When it comes - take out the middle piece of bread - is that really necessary? Plus, I can't even fit it in my mouth when they do that! You can leave a strip of bacon - it won't kill you - there's only 45 calories in a strip.... just don't load it up. Last but not least, dinner. Same rules here. Dinner is sometimes easier... a lean piece of meat with a side salad, baked potato (yes baked is fine - don't load it up! ), and veggies (steamed). It's also fine to get something that tastes a little better and is moderately healthy, as long as you don't finish it - it's probably huge anyway, right? One of my favorite things to get is a caprese salad and a shrimp cocktail. So healthy and so not boring! Red wine is fine. Keep it under 2 glasses. Almost done! Getting in a calorie burn: During the meetings, if you can't handle sitting any longer (this happens to me) Go to the back of the room and stand... just say your back hurts (it probably does, right?) Also, fidget, move your leg, clench your abs, etc. I'll be sipping green tea all day if I can swing it... calorie burn w/o movement... yes, please. Next, bring workout clothes! Even if you're not a morning worker-outer... it's SO EASY at a hotel. First, usually you get to wake up a bit later because your meetings are in a hotel - no commute. Next, it's in the building - need I say more? You'll feel so much better during the day. Plus, it's fun checking out different gyms (at least I think so?) At the very least... do this: 20 push ups, 50 jumping jacks, 20 squats, run in place for a minute, 20 alternating lunges, 30 jumping jacks, 10 push ups, 10 burpees, repeat as many times as you can handle. Hope this helps on your next trip - have an awesome night/day, everyone! Oatmeal, green tea, white tea, stevia, and detox tea. It all fits in a little ziplock!